Bloody Horror ZOMBIE FEET SHOE COVERS Walking Dead Costume Accessory Halloween Decor Horror Prop Walking Dead Bloody Foot Bones. Creepy strap-on shoe covers that have that ghoulish rotted Zombie appeal... The living will run from you, but they cannot hide. Disguise yourself head to toe and Walk amongst the Living Dead! Disturbing exposed blood covered bones and rotting grayish dead flesh adorn these gory additions to any monster, ghoul or Walking Dead zombie costume. 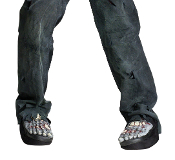 Gruesome decayed Zombie Shoe Covers fit over most shoes up to Men's shoe *size 11. Includes one pair of rotting flesh undead zombie feet that slip right on to cover your shoes. High quality detailed painted vinyl feet attached to comfortable padded fabric uppers, velcro back attachment and elastic straps to go under your shoe soles. One size fits most adults costume accessory. Featuring disgusting toenails, bulging veins and several open wounds. Even appear to have bunions, probably due to excessive brain-craved walking!